Green Prophet has featured news about the Friends of the Earth Middle East (FOEME) Eco-Centre at Al-Auja, a Palestinian village in the Jordan Valley, on a number of occasions. 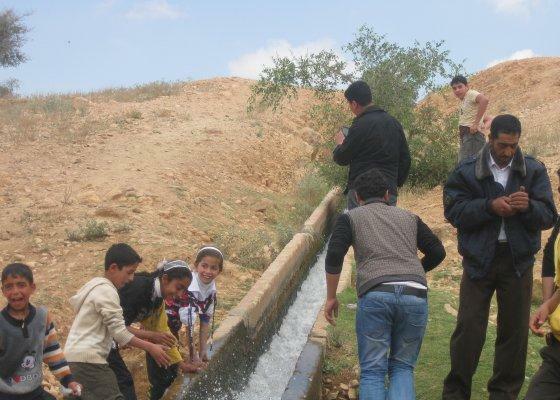 Green Prophet writer Rachel Bergstein has reported on the challenges the inhabitants of Al-Auja face because the water from their famous spring is appropriated by neighbouring settlements. And more recently, Maurice Picow wrote about the shocking pollution of the Jordan river – including the Christian ‘Baptism Site’, not far from Al-Auja. Bergstein also wrote several years ago about the potential for eco-tourism in Al-Auja, after walks in the village were included in the FOEME’s ‘Neighbours’ Paths’ programme, raising awareness of water issues and community solutions. Now, the Eco-Centre has launched its latest project, a guesthouse with space for around 40 visitors to stay in dormitories, using a shared kitchen or being served traditional meals cooked by staff from Al-Auja. The guesthouse is just one in a new trend towards community tourism initiatives in the West Bank, introducing visitors to Palestinian life and culture whilst using locally-grown food and products such as olive oil soap made by community members. In Al-Auja, an area which suffers from high unemployment and loss of farmland to settlements, the guesthouse and eco-tourism projects also have the potential to create valuable new jobs. As well as accommodation and food, the Al-Auja guesthouse offers classes in Palestinian cookery and handicrafts, bicycle hire and hikes in the Jordan Valley concentrating on the area’s biodiversity and history. The Al-Auja Eco-Centre – or to give it its full name, the Jordan Rift Valley Center for Environmental Education and Eco-Tourism Development – has a website with full information about its accommodation and activities at jvec.ps. Next Next post: White Gold Bentley Upstages Emirati Gold Mercedes – How Ungreen! Hi, my name is Risa. I am graduate student in Internation Education from US. We are working on research paper about environmental Education in Jordanian schools. We need your help to collect qualitative data for our project. Would you be interested in our survey? I can email you questions. We didn’t have much luck in our survey because long distance but we really love to bring importance of Environmental Education in Jordan to attention of our cohort. Thank you in advance for your help.